Driving while impaired in North Carolina is treated on its own separate sentencing scale within the criminal justice system. Driving while impaired is a misdemeanor in North Carolina. At sentencing the court can consider proof of any mitigating factors the defense argues, or any aggravating or grossly aggravating factors the prosecution alleges. This could be decided by the judge, or in some circumstances, a jury. Sentencing can be decided as a separate hearing after trial or included at the end of trial. Either way, evidence introduced at trial can be considered at sentencing. If you have been charged with a DWI it is crucial to have a good criminal defense attorney experienced with defending against DWI charges. If the defendant completes a substance abuse assessment, complies with its recommendations, and simultaneously abstains from alcohol. An approved continual alcohol monitoring device will be used to prove sobriety. Factors that will NOT be considered mitigating by the court for determining sentencing level include that the driver was suffering from drug addiction, alcoholism, diminished capacity, or mental disease or defect. Alcohol concentration of 0.15 or more. Chemical analysis showing this level of intoxication is presumptively conclusive in court, i.e. it is enough evidence to convict. Especially dangerous or reckless driving. Reckless behavior is that where the person knew or should have known their conduct was dangerous and acted anyway. Your defense attorney may be able to negotiate community service for jail time for Levels Five through Three. 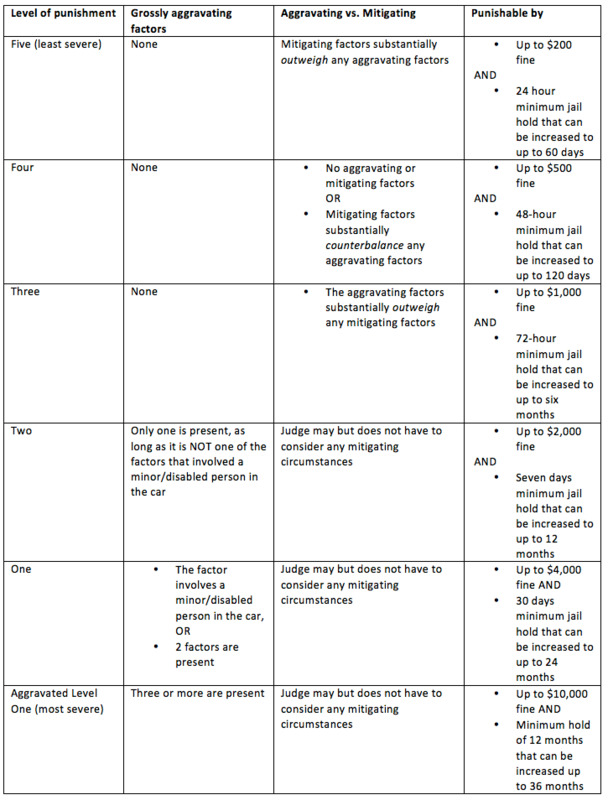 Higher-level DWIs may be able to negotiate out of jail time if the defendant agrees to certain probationary measures. If you are charged with any Level of a driving while impaired in North Carolina it is extremely important to have skilled legal representation. The defense attorneys of Arnold & Smith, PLLC fight for the rights of individuals accused of DWI almost every single day in Charlotte, Mecklenburg, Cabarrus, Union, Iredell, Gaston and the surrounding counties. Contact us today for a free consultation about your case.